I am not sure what these flowers are called, but they are really pretty. No editing required here. “Part of me suspects I’m a loser and part of me thinks I am God Almighty” – John Lennon. I think we can all relate to that quote. Enjoy your day and thanks for visiting. It looks like a grape hyacinth. Very pretty. I could be wrong though. I think you are right. Thanks for that info. Great photo! I have never seen this type of flower before. They are gorgeous! Thanks and thanks for following. My pleasure and thanks for identifying flower type. I am also sure they are a grape hyacinth. Great shot! Spectacular color and clarity. Really lovely! my grape hyacinths are just beginning to come up – I love having lots of blue flowers in the garden. Enjoy. I never really looked at them until I went close up. So nice. For sure they are pretty. The contrast between the blue and the green is awesome. Thanks Pablo. Appreciate the input. Beautiful color and clarity here. 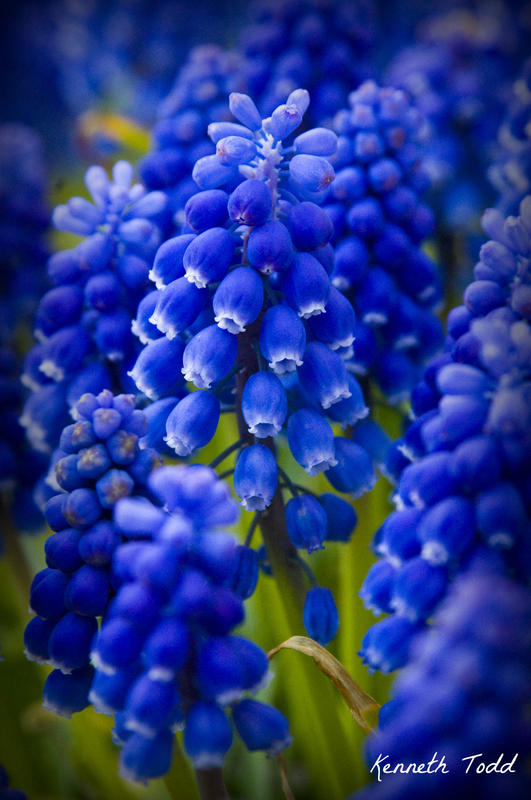 I like this different take on the grape hyacinth. Beautiful colours and perfect focus. B-E-A-U tiful! Makes me smile. Well then if you are happy, my job is done. Glad I could make someone smile today. Tks. Lovely image – one of my favourite spring flowers! Amazing photograph. The blue just POPS!